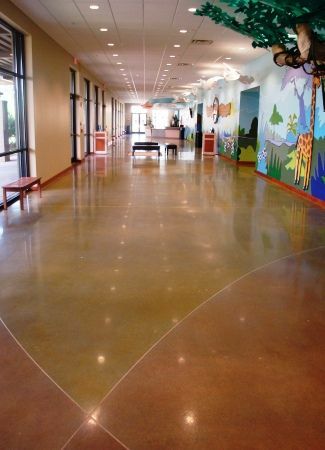 Dyed concrete floors give you an attractive, low maintenance floor. Our acetone based dyes come in a variety of colors. We can transform new or existing concrete into the floor of your dreams. Call 770-971-2778 to learn more. Using dye to color concrete requires special knowledge and equipment. This is especially true if you want a design or multi-colord concrete floor. Surface preparation is critical, and the selection and application of concrete dyes is very important. Our concrete dye experts can guide you to the best approach to achieve your desired look. Additooannly we can coach you on the do's and dont's of dyed concrete floor maintenance. Powdered acetone-based dyes for concrete are an option for indoor applications. Powdered dyes are not UV stable meaning they are prone to fading in sunlight. Advantages to using a powdered dye is a fast-drying time and good color penetration (which improves durability and wear). To do a proper installation the powdered dye is applied after concrete grinding which opens up the pores in the concrete. Powder dyed floors are good for polished floor projects. Liquid acetone dyes are essentially a solvent based stain. Unlike the powdered dyes, liquid dyes are UV stable. Liquid dyes also offer a wide variety of color options. For optimal performance liquid dyed floors should have a durable epoxy or urethane top coating.